I finally did it! I took the plunge and started spinning some of my hand spun yarn. I really wanted to highlight the first yarn that I ever spun, which is super chunky, but I knew that I did not have enough yardage to knit something out of it. 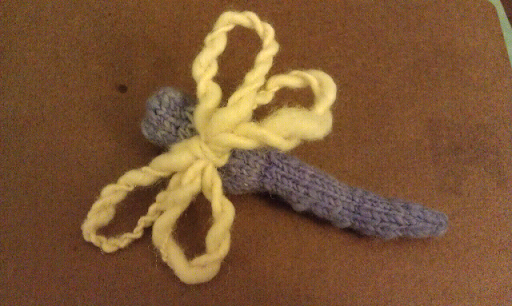 I realized that this yarn would make perfect dragonfly wings! When I wound my handspun yarn into a ball, the ball started with the wool that I spun first, much lumpier and less consistent than what I managed to do at the end. (The amount of improvement over 73 yards is amazing!) 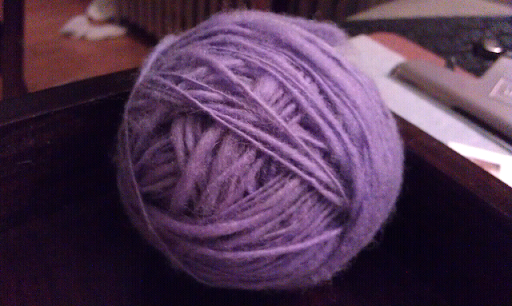 I therefore decided to rewind it into a second ball with the more even yarn in the middle. 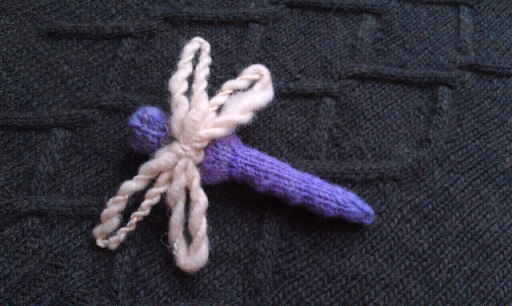 I would rather that this dragonfly feature as much of my lumpy yarn as possible. Thank you, Keith, for being a very patient swift for this project! The purple handspun had 38 g before I started knitting, 31 g remain after I knit the body. 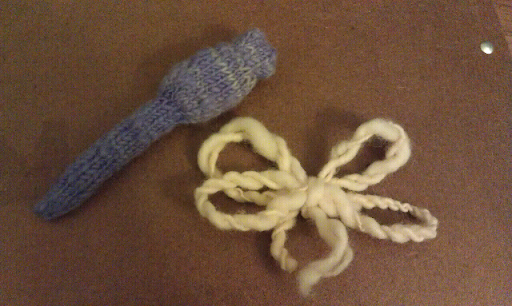 This yarn has about 12 wpi, so according to my tool that would make it a DK weight. I knit this project on size 3 knitting needles so it would be tight enough to hold the stuffing, but still show the unevenness of the yarn. About 1 yard of the white hand spun consumed. The wings looked great unblocked, but I wanted them to be a bit thinner. 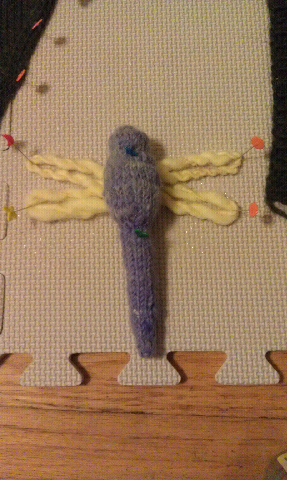 I therefore pinned the dragonfly upside down to make the wings longer and leaner. This is beautiful! I love it so much! Nice work, Rebecca!